None of what we see out of Henry here is unique. He's over-protective of his little sister and refuses to let her get involved in the action, just like Matt's attitude towards TK. He fails to acknowledge his partner's condition and throws him into a battle in poor shape. Tai's done that before. He refuses to acknowledge his teammates and believes he's the only hope to save the day. Um... we'll spare Tai more grief and give that one to Yolei. The culmination of all of these at once makes Henry look really bad here. There's no doubt that they're all under an intense amount of pressure. They're shaken by Leomon's death, staring into Zhuqiaomon's intimidating domain, believing that rescuing Calumon from it is the only way to save the world. Furthermore, while it's never communicated, none of them are confident that getting home is even possible, which has to be running through their heads as their mission nears conclusion. 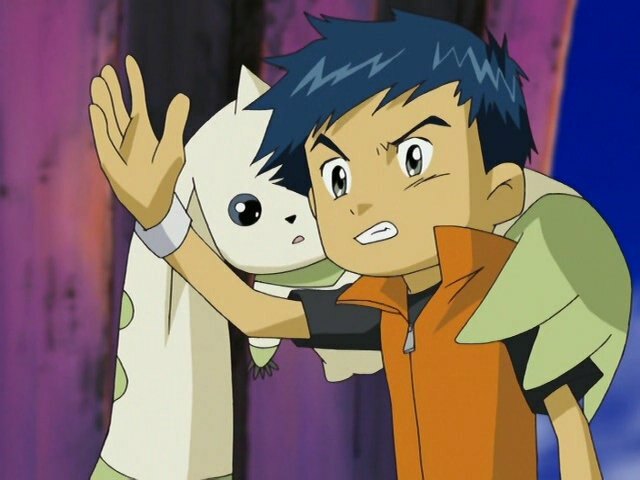 Apparently, a Digimon's concussion symptoms involve extremities fading in and out of reality. 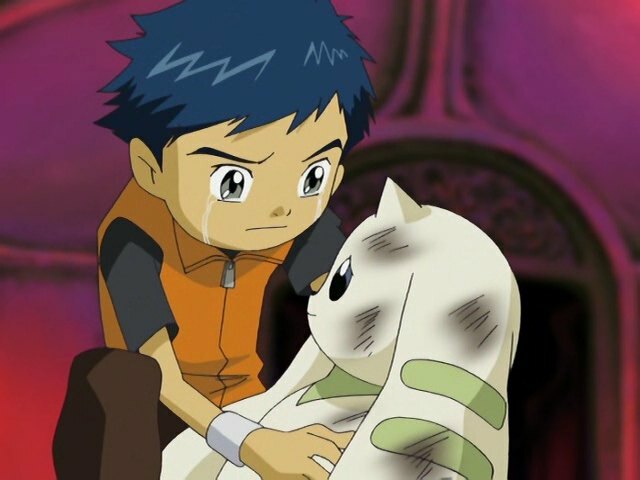 After the blow to the head he suffered last episode, Terriermon shrugs it off, either in denial or not realizing the severity of brain injuries. It's not until he evolves to Rapidmon to face Zhuqiaomon that Henry notices, and by then it's too late. Zhuqiaomon (who, it's worth pointing out, is a goddamn Sovereign and not about to lose to a bunch of Ultimates) wastes him back to Rookie. It's only then that Henry pulls the Davis Motomiya patented technique of going so far off the rails that the mere realization of how much he screwed up is good enough for a new evolution. MegaGargomon, a giant robot of a Digimon with just the happiest missiles in town, lands a few punches on Zhuqiaomon and makes the other tamers think their opponent is mortal for a moment. Spoiler: he's not. That's the thing about facing off against Zhuqiaomon. The tamers do all this because they know they have to, but at the end of the day... he's a god! You don't kill a god with Ultimates! He's in the same group as Azulongmon, the guy who stopped BlackWargreymon cold with little more than a chuckle. They're not going to do anything against him, and the notion that it would even be possible is silly. Credit the tamers for staying alive, but that's really all they could have hoped for. How bad has Henry gotten? His top priority is not getting everybody home safely, it's just getting Suzie home. That's it. Kenta can die in a fire for all he cares. Takato agrees with Henry's comment that their decisions seem to be laid out for them and they don't get to make too many choices, despite Takato just making the pretty bold decision of letting Beelzemon live. 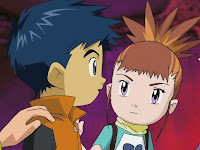 Was there a continuity error where Takato, Henry and Rika crossed the bridge only to find Kazu, Kenta, Jeri and Suzie, whom they leave in order to cross the bridge again? Encapsulating the definition of “tsundere” in one easy scene, Rika is angry at Takato's confession that he pretended to be her while sending an e-mail home, then bashfully appreciative of it, then pissed that he used hearts and smiley faces. This now marks the second time in franchise history where a boy faces drama regarding the tone of his e-mail. When he joined the team, did anybody have Guardromon down as absolute hilarity? Between his “when you start dating, you'll make many girls sad” line and “I did; I watched the whole thing,” he's proving to be awesome comic relief. Henry and Terriermon give us a little more insight into the bio-merge phenomenon as Henry comments on the feeling of energy surrounding him while the additional life force heals Terriermon's injuries. "When he joined the team, did anybody have Guardromon down as absolute hilarity?" Yup. My personal favourite is when he asks Suzie if what she's doing isn't dangerous, and then replying to her answer. Also, I like the small touch with Lopmon trying to plea with her master first, and him giving her a chance to join his side again. It didn't last long, but when she's the only Deva to show more personality, I'm accepting all I can get. "Kenta can die in a fire for all he cares." Kenta can die in a fire for all I care too. XD Kenta and Kazu, in my opinion, should never even have gone to the Digi World. Kazu and Kenta are awesome. They may be idiots but they're idiots who care about their friends. Especially when they care about how Jeri's doing and being enough of a distraction to Beelzemon for Gallantmon to stage a comeback. Also, they helped get everybody out of that mess at the end with the D-Reaper. Say what you want about these guys, they contribute what they do and its much appreciated. "Was there a continuity error where Takato, Henry and Rika crossed the bridge only to find Kazu, Kenta, Jeri and Suzie, whom they leave in order to cross the bridge again?" From what I remember, the episode opens with them power trio scouting out the bridge before returning to the rest of the group to decie what to do next (which is go back to the bridge again, this time with Lopmon too).